An innovative modern way to improve your property is installing a roof window. When you choose the Velux GPU top hung roof window with a white polyurethane finish, you will be able to increase your home’s fresh air and daylight intake while also making it look airier and more spacious. These windows are easy to install and maintain. They open up from below (up to 45 degrees) and provide an additional means of escape if necessary. The way the Velux GPU top hung roof window increases the amount of fresh air coming into your property is through an innovative ventilation flap that has been built into the frame. This feature enables you to allow an inflow of fresh air whenever you’d like. You won’t have to worry about the safety of leaving your window open while you’re asleep or away from the house. A dust and insect filter ensures that all the air coming in is clean and pure. The Velux GPU top hung roof window can be cleaned easily – simply rotate the sash by 180 degrees and slide the barrel bolt into the bushing on the bottom of the side frame. This locks the window into place so you can conveniently access and wash it. The air filter can be cleaned with any ordinary household product. 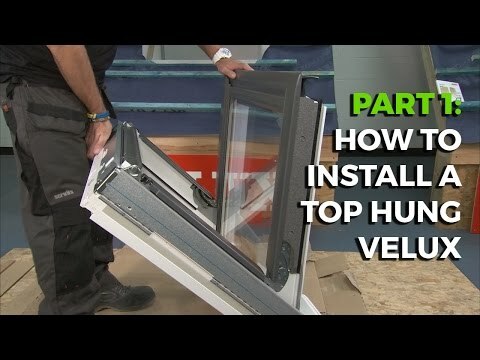 Velux only uses high performance source materials when building their windows and the Velux GPU top hung roof window with a white polyurethane finish is no exception to this rule. Every window carries a ThermoTechnology™ seal that guarantees the quality of the construction and the impressive energy efficiency. The Velux GPU top hung roof window has a sleek bright finish making it the ideal choice for modern homes. The core is made from strong thermo-modified timber that has then been coated with polyurethane making it waterproof. There are no visible joints and the window is maintenance free. There are five glazing options available for the Velux GPU top hung roof window with a white polyurethane finish. GPU 0060 Glazing – The most appropriate choice if your top priority is noise reduction. Same as the 0070, this window is double glazed and comes fitted with a laminated inner pane and a toughened outer pane. An additional layer of coating has been added that helps minimise outside sounds while also repelling dust and debris. U-value of 1.2 watts per square metre Kelvin.